Andrew Sparrow explained that after a career of writing 600 word stories, he now describes himself as a journalist, but he no longer writes news stories. He'd initially been attracted to working on the web because it seemed to offer more space to cover stories than the confines of the printed page - but increasingly it was the appeal of doing things in real-time that gripped him. It was tedious, he said, to be incrementally updating the same 600 word story during the day as things developed. Andrew went on to outline five techniques he uses in his blogging, and recommended Andrew Sullivan's “Why I blog” essay as a source worth returning to again and again for guidance on how to work in the medium. Andrew Sparrow thought having a structure to a live blog was important. He tries to open it with “this is what we expect to be announced today” to set the tone and topic in the morning, and finish the day with a round-up of key reaction to events. At Matt Wells’ session there was some discussion about what had been the earliest “live blogs” on guardian.co.uk. Two examples given showed two very different ways of structuring live blogs. One was the carefully planned set piece coverage of the G8 summit in Edinburgh. The other was the unfolding narrative of the 7/7 bombings in London. The format flexes quite well to cover both expected and unexpected news. You can't assume that people have been following every update or had the page open refreshing it all day. Andrew believes regular round-ups of the key points are important for people “dipping in” to the coverage. This does pose quite a design challenge for us. The BBC's “live pages” have their summary box offset to the right of the page, which leaves them a little divorced from the coverage. Our current solution is to use the area on an article template usually reserved for the stand-first to have a bullet-point summary of key facts and events, often with a link anchored to the most recent summary or round-up that has been posted into the body of the blog. For live blogs he felt a single dedicated authorial voice was best. You may notice on the Guardian's news live blogs that we’ve co-opted the “substitution” icon from our minute-by-minute football coverage to represent when one person is taking over from another at the helm of the coverage. I’ve often heard Janine Gibson, the editor of guardian.co.uk, describe the live blogger’s role as being like “the presenter of Grandstand”, providing context, but ultimately directing you to action going on elsewhere. Andrew said that a lot of people assume that because you have to file a lot of copy during the day, your writing style necessarily suffers. He disagreed, suggesting that he writes better now simply through the practice and discipline of writing between 6,000 and 10,000 words four days a week. 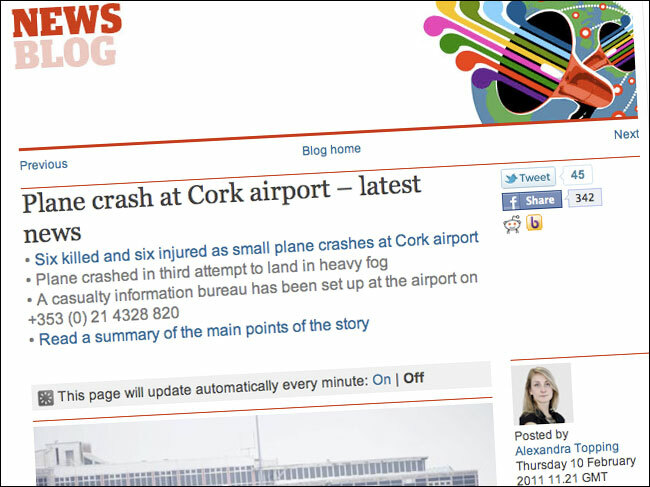 Aggregation is important in a live blog - linking out to other coverage on the web especially. Andrew said he sees it as very much an editorial and curation role - not just linking to everything, but being the person who has time to read, collate and point to the best stuff being published around a story for the benefit of those who don’t have the luxury of sitting at a desk with access to news wires, 24 hour news, and all the information that the web and social media can throw at you all day. As I mentioned yesterday, when I sat on the politics desk for a while to observe the live blogging process in action, I was left in awe at the speed with which Andrew was filing copy and it was being subbed and published. I’ve never tried my hand at live blogging myself, but it looks to be a considerable challenge, to simultaneously be following an event, reporting on it, and tracking coverage elsewhere. At the end of his talk Andrew Sparrow suggested he hadn’t mastered it yet. I’d have to beg to differ and suggest he has. By Martin Belam on 23 February 2011.